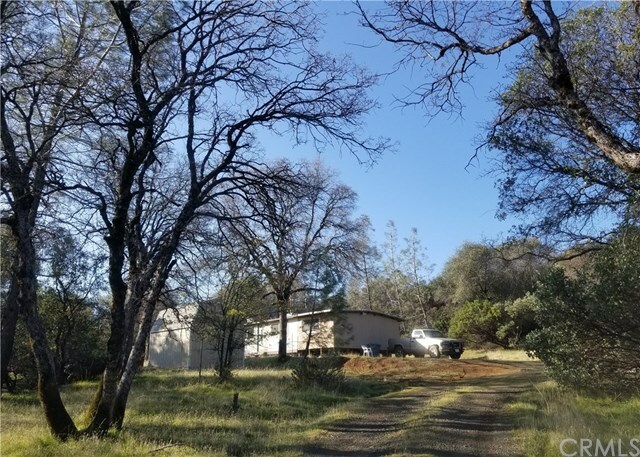 This 2.66 acre treed and all fenced foothill parcel sits at about the 2000 foot elevation for cooler summer temperatures. The Singlewide mobile home has added on rooms with dual pane windows. The newer Large tiled flooring helps for EZ care. The bathroom now has upgraded Ceramic tile and a large shower. There is a 5th wheel travel trailer that comes with the purchase and could be used for extra sleeping room. There is a raised bed garden area, 2 large wooden sheds as well as 2 metal sheds. Large 2 car carport and 1 car carport to help protect your vehicles from the weather. This Country setting is Only Minutes driving to Shopping, Restaurants, Casinos, Lake Oroville & Feather River Recreation. Property will not qualify for regular loan but owner will accept cash.